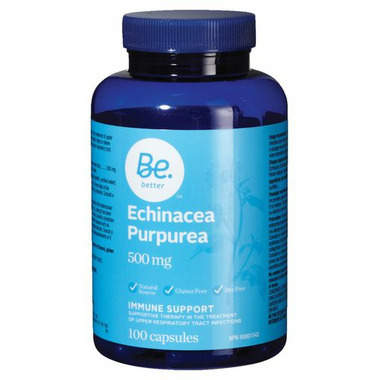 The Be Better Echinacea Purpureal is a natural, gluten free, and dye free supportive therapy in the treatment of upper respiratory tract infections. Dosage: 2 capsules, 3 times daily at the first sign of infection, or as recommended by a physician. Consult a physician for use beyond 8 weeks. Ingredients: Echinacea (Echinacea purpurea) (aerial parts and root) 500 mg Full spectrum herb: aerial parts and root of plant. Gelatin capsule (gelatin, purified water). Consult a physician prior to use if you are taking immunosuppressants, have an autoimmune disorder, or if you have a progressive systemic disease. Use caution if you are allergic to plants of the Daisy family.